398 Marlborough is located on the south side of Marlborough, between Hereford and Massachusetts Avenue, with 396 Marlborough to the east and 400 Marlborough to the west. 398 Marlborough was designed by Peabody and Stearns, architects, and built in 1887-1888 by Woodbury & Leighton, builders, for Benjamin Williams Crowninshield and Walter Channing Cabot, one of three contiguous houses (398-400-402 Marlborough) built for speculative sale. They are shown as the owners on the final building inspection report, dated December 26, 1888. 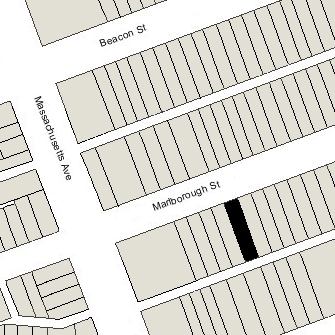 The land for 398-400-402 Marlborough was part of a parcel with a 498 foot frontage on Marlborough, extending to Massachusetts Avenue, purchased by Benjamin Crowninshield and Walter Cabot on January 20, 1880, from John Brooks Fenno and William Storer Eaton. Benjamin Crowninshield and Walter Cabot sold the remainder of the parcel as undeveloped lots. J. Brooks Fenno and William Eaton had purchased the 498 foot parcel on January 20, 1880 (the same day they sold it to Benjamin Crowninshield and Walter Cabot) from Grenville T. W. Braman, Henry D. Hyde, and Henry M. Whitney, trustees of a real estate investment trust that had purchased several parcels of land on March 1, 1872, from the Boston Water Power Company. Click here for an index to the deeds for 398 Marlborough, and click here for further information on the land on the south side of Marlborough between Hereford and Massachusetts Avenue. 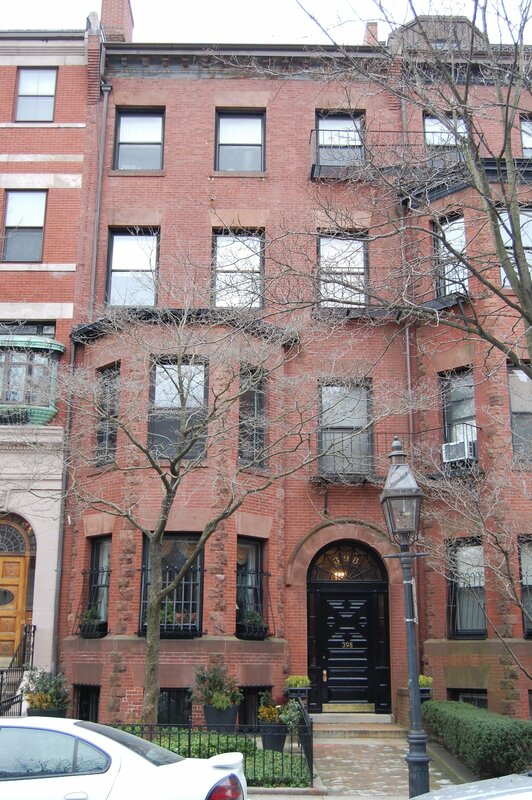 On January 1, 1890, Walter C. Cabot purchased Benjamin Crowninshield’s interest in 398 Marlborough. He acquired the house to be the home of his daughter, Ruth, and her future husband, attorney Robert Treat Paine, II. They married in May of 1890. Robert Treat Paine, II, previously had lived at 46 Mt. Vernon with his mother, Hannah Hathaway (Perry) Paine, the widow of William Cushing Paine. Robert and Ruth (Cabot) Paine continued to live at 398 Marlborough during the 1893-1894 winter season, but moved thereafter to Brookline. On March 14, 1894, 398 Marlborough was purchased from Walter C. Cabot by Dr. Joel Ernest Goldthwait. He and his wife, Jessie Sophie (Rand) Goldthwait, made it their home. He was an orthopedic surgeon and also maintained his office at 398 Marlborough. They previously had lived (and he had maintained his office) at 719 Boylston. On February 23, 1895, he transferred the property to his wife. In April of 1898, the Goldthwaits purchased 372 Marlborough and he converted it into a combination of apartments and medical offices for himself and several other physicians. They continued to live at 398 Marlborough during the 1903-1904 winter season, but moved thereafter to Hyde Park. 398 Marlborough was not listed in the 1905 Blue Book. On May 29, 1905, 398 Marlborough was purchased from Jessie Goldthwait by Emily (Bradley) Wesselhoeft, the wife of Dr. William Fessenden Wesselhoeft. They previously had lived with his father, Dr. William Palmer Wesselhoeft, at 176 Commonwealth. William Wesselhoeft was a homeopathic physician. He maintained his offices at 398 Marlborough. William Wesselhoeft’s father died in August of 1909, and William and Emily Wesselhoeft moved temporarily to his home at 176 Commonwealth. They remained there until the house was sold in December of 1911, after which they moved back to 398 Marlborough. In 1911, while the Wesselhoefts were living at 176 Commonwealth, 398 Marlborough was the home of Charles Benjamin Barnes, Jr., a lawyer, and his wife, Josephine Lea (Low) Barnes. Their primary residence was in Hingham, but in 1909 they also had maintained a Boston home at 211 Beacon. When the Wesselhoefts moved back to 398 Marlborough, the Barneses moved to 176 Commonwealth for the 1911-1912 winter season. By 1913, they were living at 111 Marlborough, Charles Barnes’s parents’ former home (his father died in June of 1912). The Wesselhoefts continued to live at 398 Marlborough until about 1918, and he continued to maintain his medical offices there. In 1918-1919, he was a Lt. Colonel in the US Army, serving as director of Base Hospital 44 at Fort Dix, New Jersey, and in France. By 1920, they had moved to The Austerfield at 7-9 Massachusetts Avenue, and he had moved his offices to the Hotel Cambridge at 483-485 Beacon. Emily Wesselhoeft continued to own 398 Marlborough and lease it to others. The house was not listed in the 1919 Blue Book. By the 1919-1920 winter season, 398 Marlborough was the fraternity house of the MIT (Lambda Zeta) Chapter of Lambda Chi Alpha. It previously had been located at 200 Bay State Road. It continued to be located at 398 Marlborough during the 1921-1922 season, but moved thereafter to 463 Commonwealth. By 1923, it had become the MIT chapter of the Phi Mu Delta fraternity. It continued to be located there in 1924, but had moved to 354 Commonwealth by 1925. The property changed hands and on July 14, 1925, was acquired by Donald MacDonald. He and his wife, Victoria Adelle (Lang) MacDonald, lived in Metheun. In 1925, 398 Marlborough was the home of Lena E. (Marsh) Bryer, the widow of John H. Bryer, Jr., where she operated the Candle Light Tea Room and also maintained a lodging house. She previously had lived in Westfield. She had moved from 398 Marlborough by 1926. On July 13, 1926, 398 Marlborough was acquired from Donald MacDonald by Miss Marie Louise Vernier, who operated it as a lodging house. She previously had lived at 32 Appleton. By 1929, she had been joined by Miss Marguerite E. Dirivachter. Both were born in France and immigrated in about 1915. Marguerite Dirivachter was a teacher and had worked as a governess after coming to the United States (at the time of the 1920 US Census, she was a governess in the home of Carl Dreyfus and Sylvia (Goulston) Dreyfus at 312 Dartmouth). On December 27, 1946, Marie Vernier transferred the property to herself and Marguerite Dirivachter. Marguerite Dirivachter’s August 27, 1991, obituary in the Boston Globe (in which she is called “Mademoiselle Marguerite Dirivachter”) indicates that “she and two friends bought a house on Marlboro St., Boston, in 1929, where they ran a rooming house which provided women employed by the Christian Science Monitor with a place to stay.” The date appears to refer to when Miss Dirivachter moved to 398 Marlborough; the identity of the third friend is not known. On January 13, 1958, Marie Vernier and Marguerite Dirivachter transferred 398 Marlborough to Louise R.Bybee, Charlotte E. Parker, and Ralph Courtney, trustees, Spiritual Science Foundation. The had been formed by Charlotte Parker in December of 1945 “for the encouragement, preservation and furtherance of spiritual values in religious, scientific and social life in accord with the Anthroposophical or Spiritual Scientific teachings of Rudolf Steiner.” At the same time as it purchased the house, the foundation entered into a lease agreement with Marie Louise Vernier and Marguerite Dirivachter establishing their right to live at 398 Marlborough and operate it as a “guest house,” rent free, for the remainder of their lives. Marie Vernier died in July of 1958. Marguerite Dirivachter continued to live at 398 Marlborough and operate it as a lodging house, and on August 16, 1971, the Spiritual Science Foundation transferred an undivided one-half interest in the property to Kurt S. Giffen, trustee on her behalf. Marguerite Dirivachter continued to live at 398 Marlborough until 1981. On November 23, 1981, 398 Marlborough was purchased from Marguerite Dirivachter’s trust and from the Spiritual Science Foundation by John A. Coppola. On June 30, 1982, 398 Marlborough was purchased from John Coppola by Babak Bagheral, trustee of the 398 Marlborough Trust. In June of 1987, he filed for (and subsequently received) permission to convert the property into seven apartments. There was no prior record of the legal occupancy, but in filings associated with the application, it was stated that the property had been a lodging house since the mid-1960s. On January 11, 1994, 398 Marlborough was purchased from Babak Bagheral by Neil Harwood. On August 31, 1998, 398 Marlborough was purchased from Neil Harwood by the Marlborough Kostigen LLC (Richard J. Kostigen, manager). On October 8, 1998, it converted the property into seven condominium units, the 398 Marlborough Condominium. That same month, Marlborough Kostigen LLC applied for (and subsequently received) permission to add a penthouse. In May of 1999, it applied for for (and subsequently received) permission to reduce the number of units from seven to six, and on September 27, 1999, it amended the condominium master deed to reflect the reduced number of units.